Tzipora (Tzipi) Livni was born in 1958 in Tel Aviv to Eitan and Sarah Livni. Her father was head of operations for the Jewish resistance movement the Irgun, and was later named a Likud minister in Menachem Begin's government. Livni served as a lieutenant in the IDF and followed by serving as a Mossad officer between 1980 and 1984. A graduate of the Bar-Ilan University Faculty of Law, she specialized in labor laws. In 1996 she was named director of the Government Corporate Authority. In 1999 she was elected to the 15th Knesset on the Likud's list and named member of the Knesset's Constitution, Law and Justice Committee and the Ministerial Committee for the advancement of women in Israel. With the forming of the unity government in 2001, Livni was named minister of regional development, but step down; later to be named agricultural minister. The 16th Knesset saw then-Prime Minister Ariel Sharon name Livni minister of immigrant absorption. In late 2004, she also served as housing and construction minister for a few months. In 2004, Livni was honored by the Movement for Quality Government in Israel, which named her one of its Knights of Governance for that year. In early 2005 Livni was named justice minister and in November of that year she followed Ariel Sharon, left the Likud and joined Kadima. 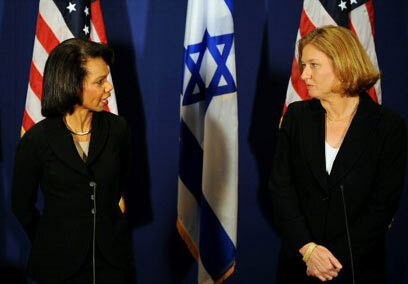 In January of 2006 she was named foreign minister by then-acting Prime Minister Ehud Olmert, and in May 2006, after Kadima won the 2006 elections, she reassumed her position as foreign minister and was also named locum-tenens of the prime minister. In September 2008, Livni replaced Olmert as Kadima chairwoman following a narrow victory in the party's primary elections. In the 2009 elections, Kadima won the largest number of Knesset seats - 28 - but decided not to join the government after President Shimon Peres tasked Benjamin Netanyahu with forming the new coalition. Livni then assumed the role of opposition leader. Voted one of Time Magazine's 100 most influential people for 2007, Livni is the second woman to be named foreign minister of Israel. Golda Meir served as the first woman holding the title from 1956 to 1966. In March 2012, Livni lost her second bid for the Kadima chairmanship to Shaul Mofaz. Her Hatnua party won six mandates in the January 2013 elections, and she currently serves as justice minister in Israel's 33rd government. Livni is married to Naftali Spitzer and has two children, Omri and Yuval.